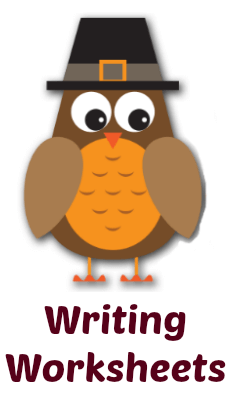 Welcome to my adjectives lesson plans page. 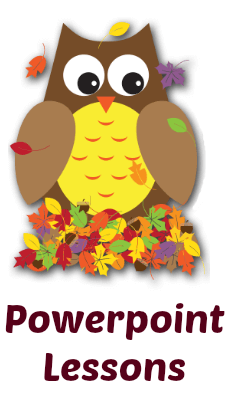 On this page, you will find 2 fun activities (Thanksgiving Adjectives and Busy Bees Grammar Comparing) that review adjectives using engaging powerpoint presentations. Include a student response worksheet that you can print out so that students are actively participating, engaged, and on task. 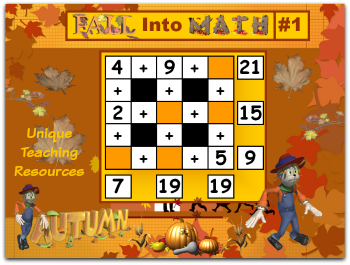 Have a fun game-like format and students record their answers, points, and/or score on the student worksheet. 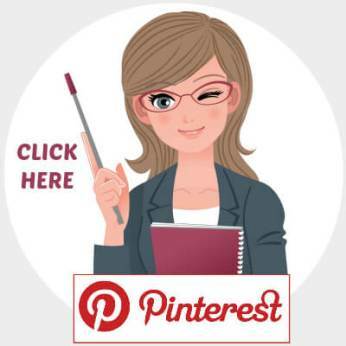 Can be edited and you are able to delete and add slides to the presentation. Note: I have not added any sounds to these powerpoints, as I find them distracting when I am presenting a lesson to my students. 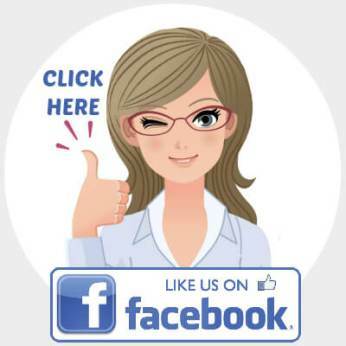 You can easily add your owns sounds to these presentations. 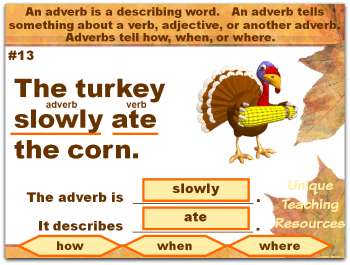 Students have to find an adjective in each Thanksgiving sentence and the noun that it modifies. Then students have to decide if the adjective describes what kind, which one, or how many. large, fat, fast, hot, high, late, sad, pretty, loud, many, delicious, bad, good, difficult, and little. 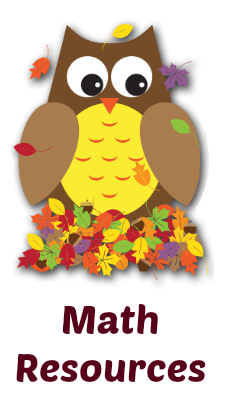 Above: This is the title slide in this set of adjectives lesson plans. 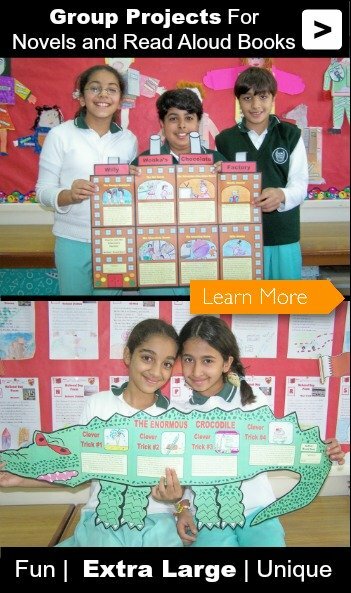 This activity requires students to select the adjective in each sentence and the noun that it modifies. 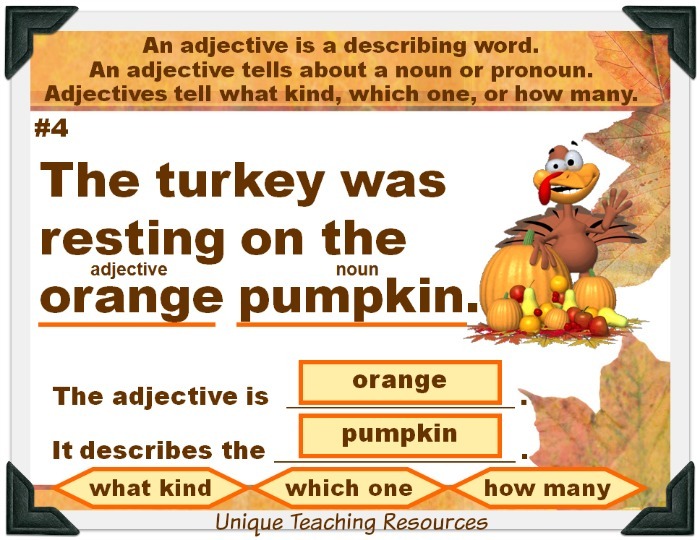 Students have to decide if the adjective describes what kind, which one, or how many. 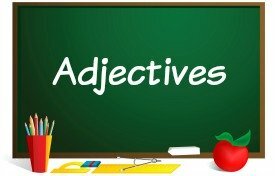 Above: Students (1) name the adjective, (2) the noun it describes, and if the adjective is describing (3) what kind, which one, or how many. There are 20 sets of question and answer slides in this powerpoint presentation. Above: Example of question slide (left) and answer slide (right). 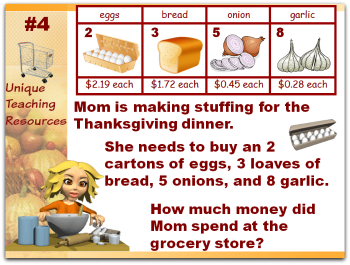 This powerpoint presentation includes a student response worksheet for students to write their answers on. 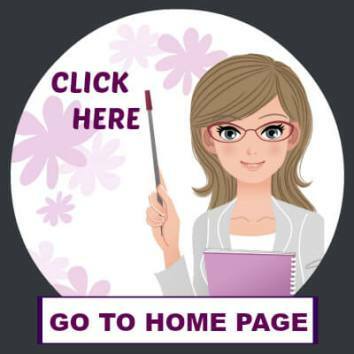 Your students will be actively engaged and on task as they follow along with your powerpoint lesson by writing their answers to each question on their worksheets. 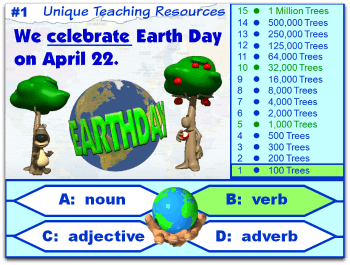 Above: This student answer worksheet is located on Slide 44 of the presentation. 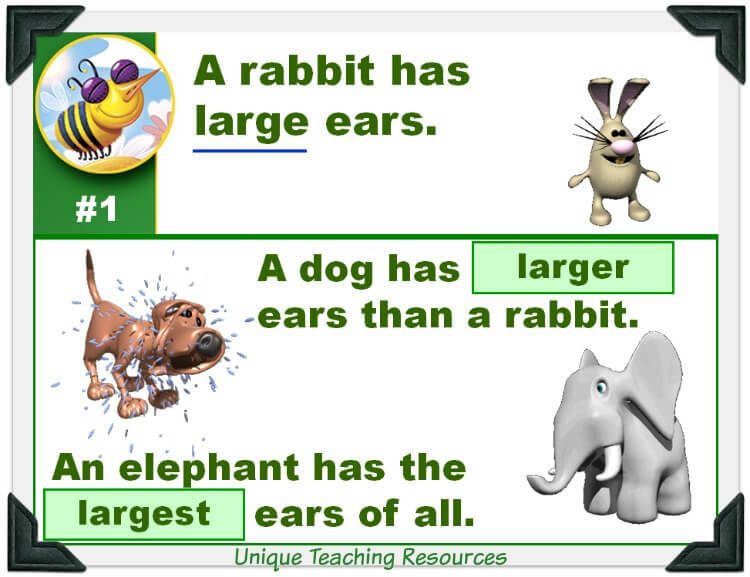 You can purchase these adjectives lesson plans below. that have a Thanksgiving theme? 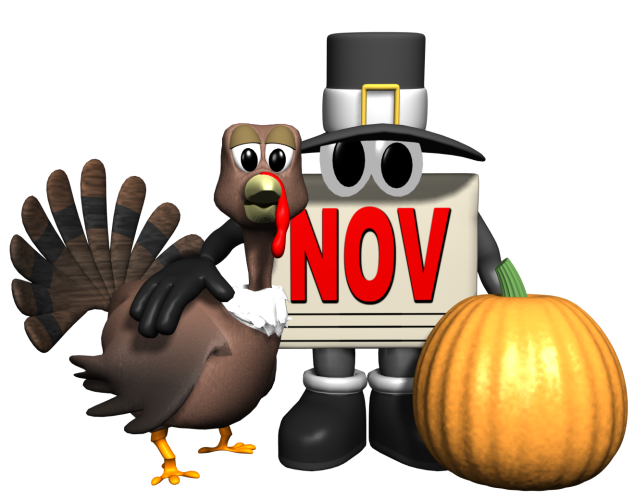 I have created 5 Thanksgiving powerpoint presentations. 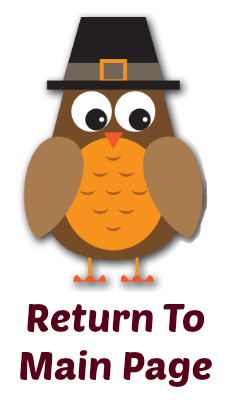 Click on the graphics below to view each lesson. 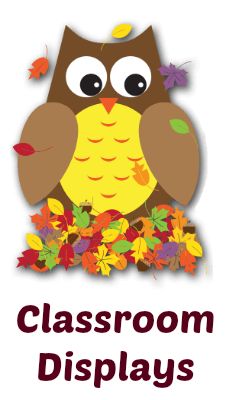 Click on the owls below to view the different categories of Fall and Thanksgiving teaching resources that are available on this website. Note: This powerpoint lesson reviews comparative and superlative forms of words, but I have not used those terms in this powerpoint. I have found that my students understand this concept better when I call them comparing 2 things and comparing 3 or more things. Once my students have mastered this concept, then I introduce the words comparative and superlative into my students' vocabulary. Since this is a powerpoint file, once you have downloaded it, you are able to change any of the text that you want. 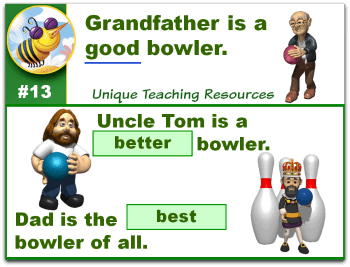 If you want to use the terminology comparative and superlative, you can easily change this on the student worksheet and the title slide. 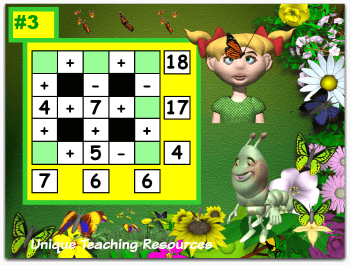 This lesson activity is set up with a general spring bee theme, but it can be used anytime of the year. 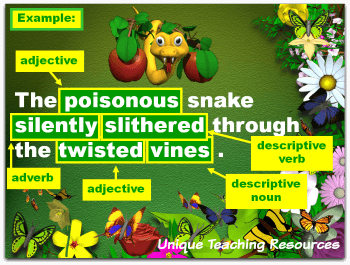 It reviews comparative and superlative words in an engaging way with fun animated graphics. 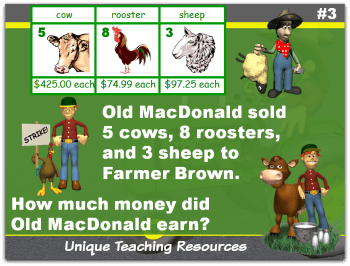 Your students will love playing this engaging powerpoint game. 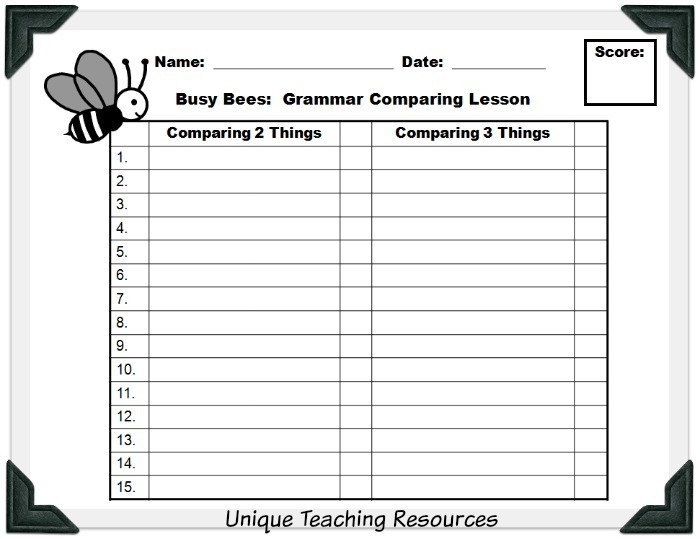 The three animated visual cues that are on each page will help your students to better understand these comparison words. 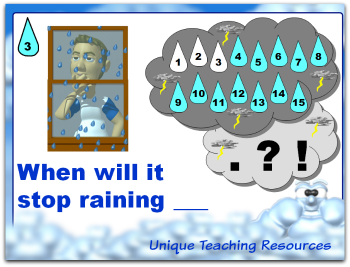 Above: This student answer worksheet is located on Slide 37 of the presentation. 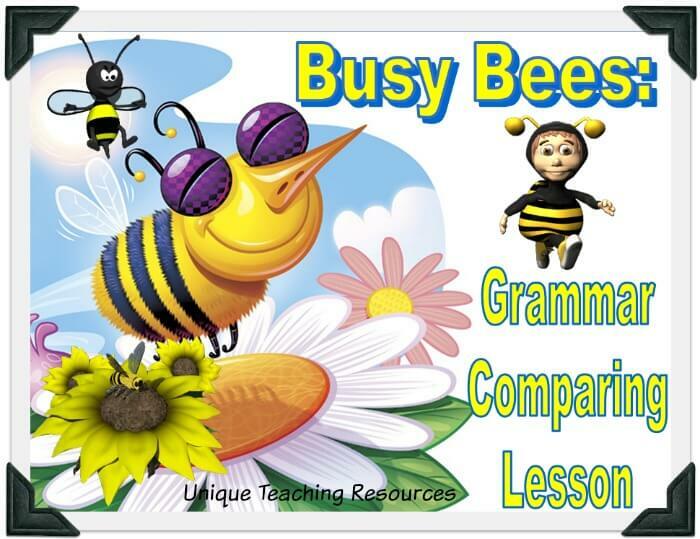 You can purchase this Busy Bees powerpoint lesson below. 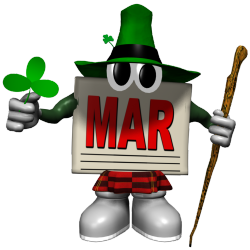 that have a Spring theme? I have created 6 Spring powerpoint presentations. that have a Spring theme. 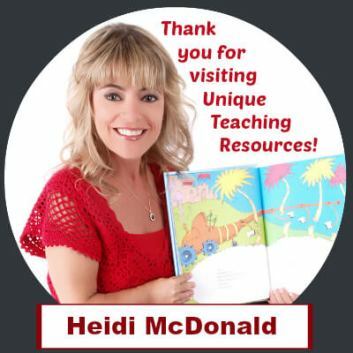 teaching resources that are available on this website. 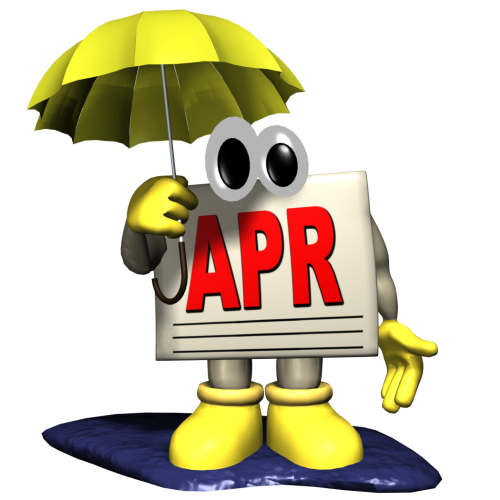 Click HERE (or on this calendar) to view a LARGE list of creative writing ideas for the month of April. 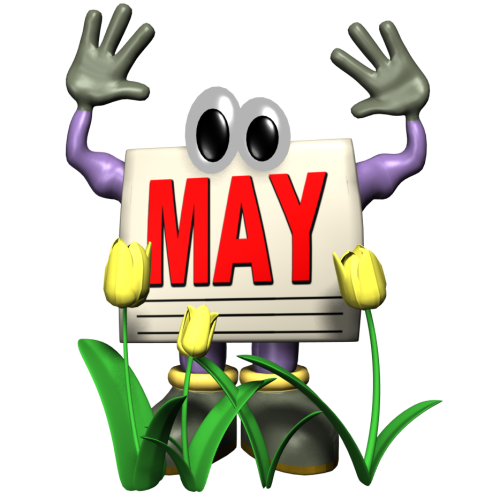 Click HERE (or on this calendar) to view a LARGE list of creative writing ideas for the month of May. 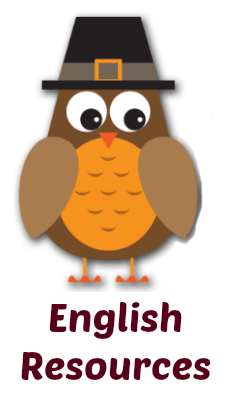 Below you will find a YouTube link for a video about adjectives that you can share with your students. 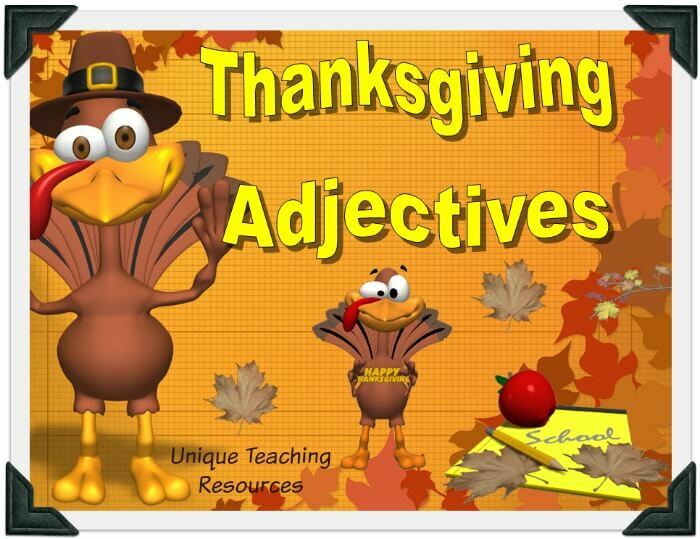 Thank you for visiting this adjectives lesson plans page.